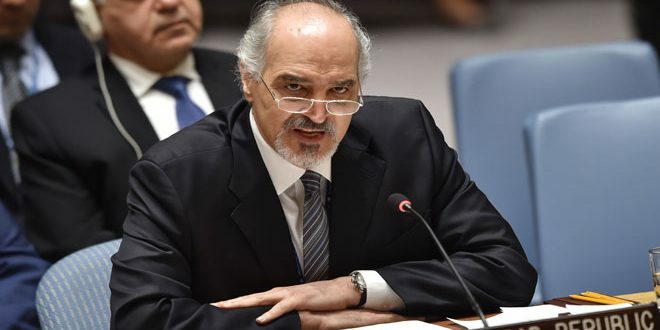 New York, SANA – Syria’s Permanent Representative at the UN Dr. Bashar al-Jaafari said that the tripartite US-British-French aggression on Syria came as a revenge for the defeat of these three countries’ terrorist proxies in Ghouta. During a Security Council session held on Saturday upon Russia’s request to condemn the tripartite aggression on Syria, al-Jaafari said that this aggression gives a message to terrorists encouraging them to use chemical weapons again in the future, adding that Syria and its allies and friends will respond to this aggression. He said the US, Britain, and France should read the UN Charter and realize their responsibility is to protect international peace and security, not undermine them, and that they must cease immediately from supporting armed terrorist groups in Syria and from lying and fabricating allegations to justify their aggression on Syria. Syria’s Representative detailed the tripartite aggression on Syria, which took place at 3:55 AM on Saturday April 14th, and involved firing around 110 missiles at Syrian territory in the capital Damascus and other areas, and in response to it Syria exercised its right to defend itself, with its air defense systems repelling many missiles, while a few missiles hit a research facility in Barzeh area in Damascus that contained an educational center and science labs, causing only material damage. 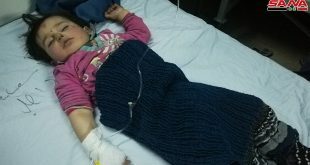 He added that a number of missiles that targeted a military site near Homs city were driven off course, with one of them injuring three civilians. Al-Jaafari said that the three countries set the stage for their aggression using claims of using chemical weapons, and they instructed terrorist groups to stage a fake scenario of using chemicals in Douma, employing fake witnesses and manipulating the alleged crime scene to set up an excuse for this blatant aggression that can only be construed as the US, Britain, and France trying to take revenge for the defeat of their terrorist proxies in Ghouta. He noted that those who fabricated the chemical incident scenario in Ghouta were arrested and they confessed to falsifying this incident, and the video showing that is available if the Security Council’s president wishes to obtain it. Al-Jaafari pointed out that this aggression came at a time when the investigation mission from the Organization for the Prohibition of Chemical Weapons (OPCW) arrived in Syria upon the request of the Syrian government to investigate the alleged incident in Douma, and therefore the message sent by the three aggressors is that they don’t care about the Security Council’s mandate and they don’t want a transparent and professional investigation; rather they seek to obstruct the investigation and presume its result to cover up their lies. “You three aggressors: you are pretenders, hypocrites, and liars, and you foil any UN action that does not serve your interests. Since the organization was established, you have been exploiting the work of any international team or obstructing their mission,” he said, citing what happened with fact-finding missions for Iraq, Libya, and Syria. 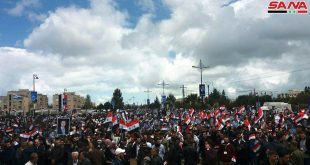 “The main headline on American and Western mass media last night was lies and deception in a prefabricated media campaign to promote a fake victory and fabricated achievements that they know implicitly to be mere lies,” al-Jaafari said. He said that during the aggression, the US Defense Secretary and his Chief of Staff were unable to answer objective questions, eliciting pity as they stood like lazy students repeating hollow phrases that didn’t answer the questions of a journalist who asked how can they target what they claim to be depots of chemicals as such an act would threaten civilian lives if these supposed chemicals leak, nor could they answer another journalist who reminded the Secretary that he said a day before that there is no proof of the alleged chemical attack in Douma, so what changed in the past few hours? Al-Jaafari reiterated Syria’s condemnation in the strongest of terms of the triparitite aggression that shows a disregard for legitimacy, adding that Syria is disgusted by the disgraceful position of Qatar that supported the three countries and allowed them to attack Syria from an American base in it. He said that Syria demands that the international community and the Security Council condemn this aggression that will only escalate tension in the region and the world. Commenting on the statement of the French Representative who claimed that the three countries attacked Syria on behalf of the international community, Syria’s Representative asked if these three countries were given permission by the Security Council to carry out this attack. He also wondered if what the US, British, and French representatives claimed about targeting sites for producing chemicals was true, why didn’t they share that information with the OPCW? 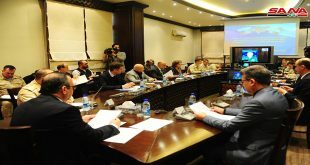 Al-Jaafari noted that the OPCW fact-finding team arrived in Damascus on Saturday afternoon after being delayed for unknown reasons for a whole day, and during that delay the aggression took place, as if the team was instructed to not go to Damascus until the aggression is carried out. 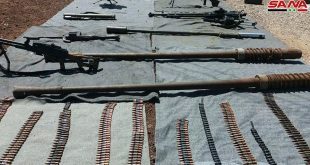 He noted that the research facility in Barzeh that was attacked was visited by the OPCW twice last year, and they provided an official document proving that it contained no chemical activities that contradict Syria’s obligations towards the OPCW. “There are some in the Security Council who would rather ignore the elephant in the room which is the direct American military violation of Syrian sovereignty and its occupation of a third of its countries,” he said, adding that some who claim to be fighting Daesh (ISIS) in Syria and Iraq act as Daesh’s air force, targeting the Syrian Arab Army and its military position to prevent it from defeating Daesh, yet Syria and Iraq defeated the terror organization in three years.